I remember as a young lad marveling at a fancy segment of a three-strand Manila rope. 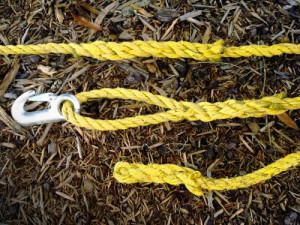 My father had spliced two ropes together and I was intrigued by it’s appearance. He told me that one rope could be woven into another rope or back into it’s self in different ways. I asked him to teach me how to do it and then practiced splicing whenever I could. Because of that early experience I was able recently to redeem some salvaged ropes that gave me a usable longer rope for odd jobs. A few weeks ago I was able to pull my son’s car out of a muddy ditch by using that rope which gave me a real sense of satisfaction. It turns out that my son’s car had no anchor points to tie onto underneath the rear so I had to weave the rope in and out of the slotted chassis frame in order to attach it. That took some time to accomplish and as a result I decided to buy a “slip hook” for shallow attachment situations. Having one splice in the rope already, I decided to continue the theme by attaching the slip hook using an “eye splice” where the end of the rope forms a loop when the end is spliced into it’s side. A loop such as this can be a great attachment point for other apparatus as well. At the other end of the rope I made a “back splice” that makes a nice termination similar in function to whipping a rope to keep the end from unraveling. There are a number of “how-to” videos and articles online that are well worth viewing and I recommend that they should be followed by personal practice to gain valuable experience. Rope and cordage skills should be a part of your emergency preparation skills and can save the day when needed. This entry was tagged Cordage, Knots, Practice, Rope, Splice. Bookmark the permalink.